The Vocational Evening School EPAL invites you to their open day events packed with information, interactive events and interesting talks, e.g. about climate change. Support the efforts of the EPAL and honour their work by paying a visit to them!! Take a tour of the school, see the variety of facilities, talk with the students and with subject specialists! 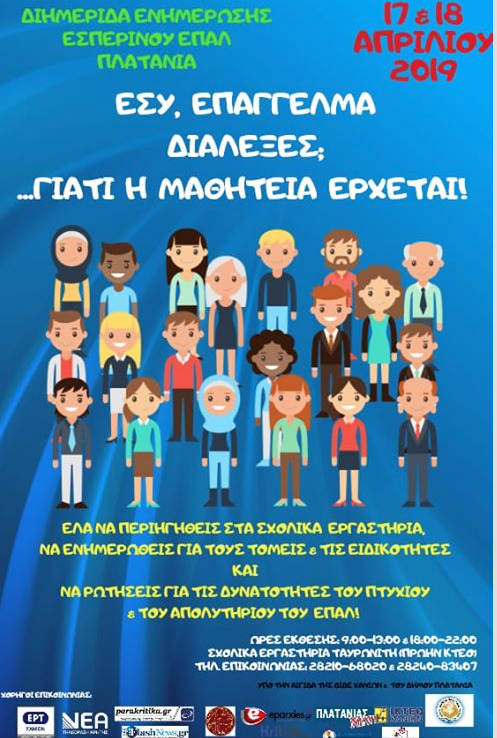 Wednesday 17th April 19.30: briefing on the “Postgraduate Year – Apprenticeship Class of EPAL & Certification Examinations”by Mrs. Trikka Maria, in charge of the Apprenticeship Support Office EPAL of the Chania Prefecture. Thursday 18th April 19.30 : “Climate Change, causes and results”. Speaker: Mr. Lekas ​​Manolis. Students, parents, high school graduates, as well as all citizens are invited to visit the EPAL to find out about the variety of sectors and subjects, the EPAL certificate, professional opportunities, apprenticeships and access to higher education. The exhibition is under the auspices of the Municipality of Platanias.